Q.　I would like to know about the password policy for archive accounts. A. We adopt the following password policy to prevent users from the brute-force attack or unauthorized use. - When a user inputs a wrong password 6 times, the account will be locked and that user will be unable to log in for 15 minutes. 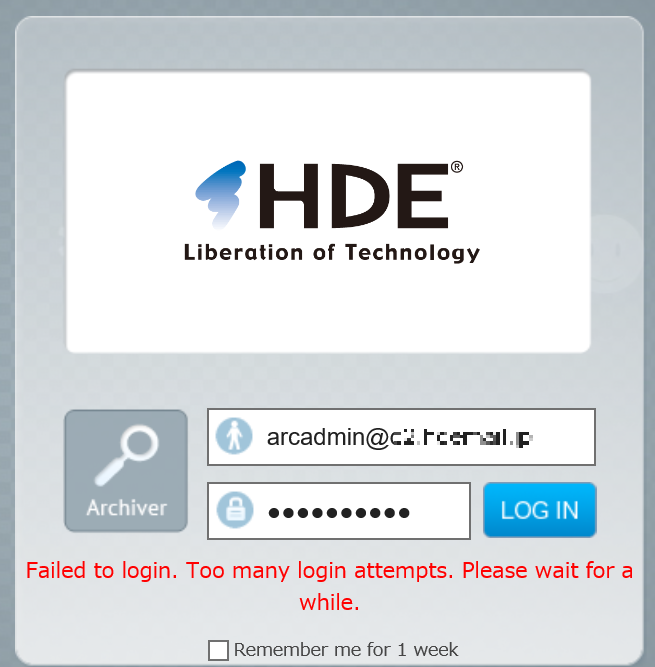 "Failed to login. Too many login attempts. Please wait for a while." * Other users in the same domain can still log in normally (unaffected). - When a certain user's password is changed by another user (such as Domain Admin or User Admin), the next time that the user logs in, s/he will be forced to change the password. 1. User A (Domain Admin) changes user B (Domain Viewer) password. 2. When user B logs in, user B will be forced to change their password. 1. User A (Domain Admin) creates a new user: user C (Domain Viewer). 2. The first time user C logs in, they have to change their password to a new password. - When another user (such as Domain Admin or User Admin) changes a certain user's password, a login password for the administrator user who is about to rest the password (such as Domain Admin or User Admin) will be required.